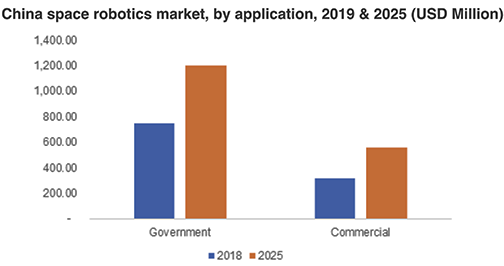 The space robotics market is experiencing a rapid technical development owing to the integration of AI technologies into the systems developed for space exploration. 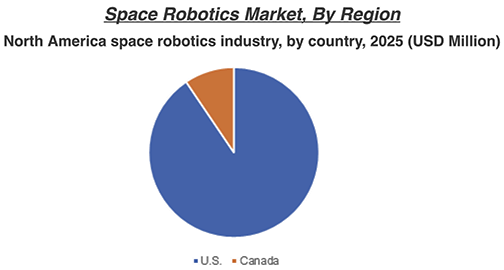 A new report and analysis from Global Market Insights, entitled Space Robotics Market, is now available. Global Market Insights reveals that several companies are developing AI-based robots that provide enhanced mobility and manipulation benefits. These machines can perform highly-complex tasks for a longer duration and offer minimal human dependence. The integration of AI offer 3D perception and proximity GNC to robots, which will support resistance against environmental conditions and offer high flexibility, accuracy, and control. In November 2018, an AI-based robot, CIMON, started its first conversation with the spacefaring crew. The robot is designed by DLR Germany in collaboration with IAM and Airbus. Moreover, the increasing experiments & projects related to space exploration by government agencies globally are attributing to the market demand. In the space robotics market, robotic arms are witnessing a high demand for the deployment in advanced space systems. Robotic arms aid astronauts in lifting and handling heavy and large objects in space. Moreover, rovers are spacecraft that use exploration vehicles and perform the transportation of crew members from one spaceflight to another. The companies working in the market are developing partially or fully autonomous rovers for exploration and transportation applications. In January 2019, NASA announced that it has developed a unique rover for the Mars 2020 mission, which is painted with a formulation for reducing chemical gas release that will impact scientific experiments. Near space exploration and transportation segments are gaining popularity due to several missions working on asteroid survey missions — the need for continuous maintenance and servicing of the existing satellites is creating a huge demand for this segment, adding up to the market growth. The near space transportation segment uses advanced transportation systems that support transporting of heavy cargoes to the existing objects for repairing & other purposes. Various companies are gaining huge investments to carry out their near space transportation projects. For instance, in May 2018, Zero 2 Infinity, a near space transportation company, announced that it has gained an investment of $1.30 million from Crowdcube in support of their space accessibility project. North America is a leading participant in the market owing to the presence of national organizations, including NASA and CSA, that are actively working toward the industry development. The U.S. and Canada are investing huge amounts in R&D and technology enhancement to achieve space exploration initiatives. 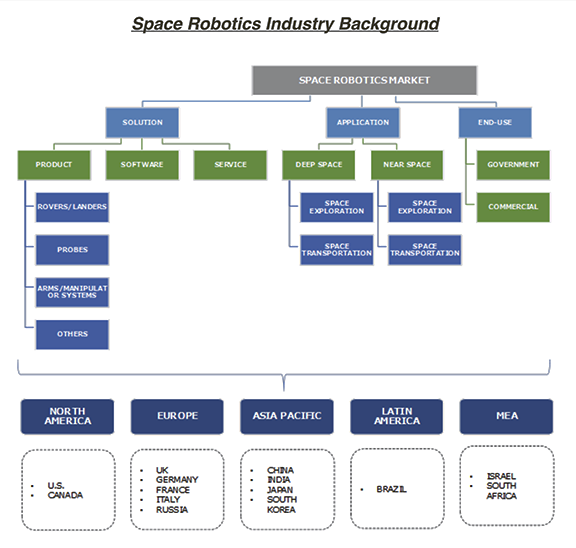 The Asia Pacific space robotics market is also growing at a rapid pace in countries including India, Japan and China due to several on-going and upcoming space projects. In September 2018, Japan Aerospace Exploration Agency announced that its two rovers had successfully landed on an asteroid named Ryugu and started a survey on its surface. These robots are efficiently working in the low gravity environment, allowing them to gain knowledge on Ryugu’s physical aspects.